Serial number #37-2177. Does anyone know the model number, and where can I get parts & manual? I am looking for pictures of the pulley/drive area of this machine. I am currently restoring the same machine but have no reference to assemble and the order/placement of the3 pulleys. Would you be able to pst something? 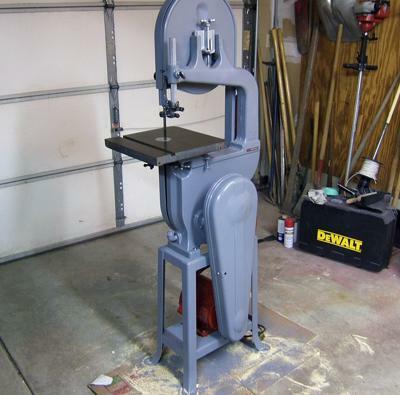 I also have the same bandsaw! My 1940/50 Delta 14" bandsaw differs a bit from your unit whereas mine has a cast iron top wheel cover housing with a hindged door swing. Thus making the entire unit cast iron. I also can not locate information reguarding the unit and/or parts. I need the rubber bands that slide over the wheels. mine are worn and will not allow the bandsaw blade to track within the guides. Anyone with any information,please post. HEY DAN...ALMOST ALWAYS ON E-BAY YOU CAN FIND MANUELS FOR 5.95.....I'VE GOT A 1939 14" WITH THE ENCLOSED CAST IRON BASE...BEAUTIFUL STUFF!! !